In the ranked publication and citation distribution, h-core and h-tail are naturally generated via h-index, on which related dynamic core-tail measures are introduced, including shape descriptors and shape centroids, k-index and \(k'\)-index. I acknowledge the National Natural Science Foundation of China Grants (number 70773101, number 7101017006 and number 71173187) for the financial support. Thanks for the collaborations of Prof. Dr. Dar-zen Chen, Prof. Dr. Muhuan Huang, Prof. Dr. Loet Leydesdorff, Prof. Dr. Ronald Rousseau et al. in the studies, and Dr. Max C H Kuan, Ms. Huei-Ru Dong et al. in data assistances. This chapter is extracted and integrated by three published papers: (1) Ye and Rousseau (2010). Probing the h-core: an investigation of the tail-core ratio for rank distributions. 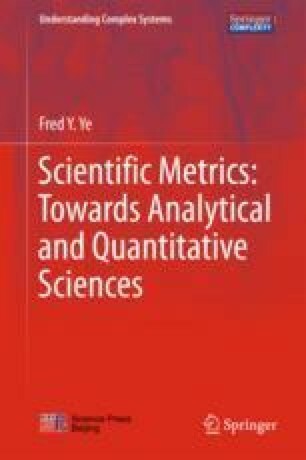 Scientometrics, 84(2): 431–439; (2) Chen, D. Z., Huang, M. H. and Ye, F. Y. 2013. A probe into dynamic core-tail measures for h-core and h-tail. Journal of Informetrics, 7(1): 129–137; (3) Ye and Leydesdorff (2014). The “academic trace” of the performance matrix: a mathematical synthesis of the h-index and the integrated impact indicator (I3). Journal of the Association for Information Science and Technology, 65(4): 742–750.